Is there a better alternative to Iconifer? Is Iconifer really the best app in Icon Tools category? Will Iconifer work good on macOS 10.13.4? Iconifer ... 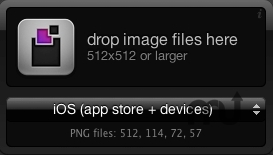 Helpful OS X Dashboard widget for converting images into iOS, Mac, and/or Windows icon formats. Automatically generates iTunes, iPhone 4, iPad, and iPhone PNG files, or outputs ICNS or ICO files with all necessary sizes. Requires ImageMagick and libicns command line tools (can be installed via MacPorts). Iconifer needs a review. Be the first to review this app and get the discussion started! Iconifer needs a rating. Be the first to rate this app and get the discussion started!